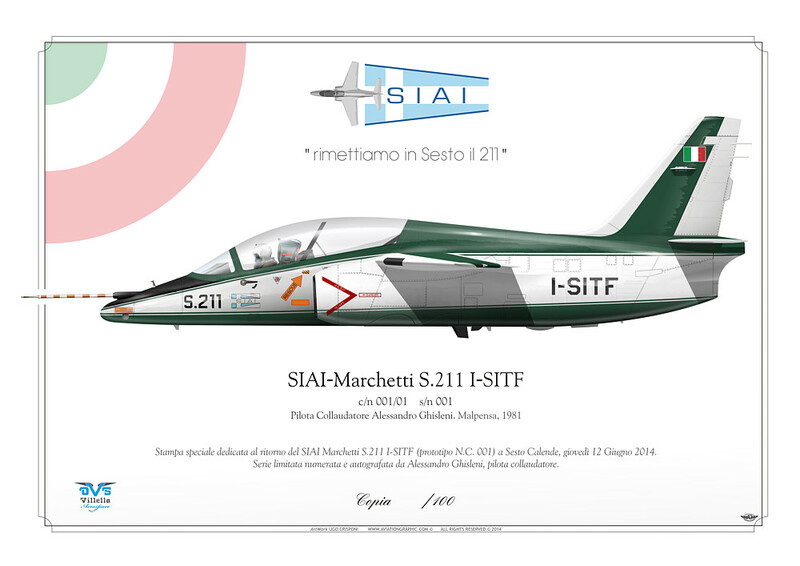 The SIAI-Marchetti S-211 (later Aermacchi S211) is a turbofan-powered military trainer aircraft designed and originally marketed by SIAI-Marchetti. Some 60 aircraft have been sold to air forces around the world. Aermacchi bought the production rights in 1997. The redesigned M-311 (now M-345) is currently under development by Alenia Aermacchi. SIAI-Marchetti began work on the aircraft in 1976 as a private venture basic trainer, hoping to offer it to the company's existing customer base of small air forces operating their piston-engined SF.260. Formally announced in Paris the following year, interest was strong enough to justify the construction of two prototypes, the first of which flew on 10 April 1981. The Singapore Air Force placed the first order for ten aircraft in 1983.The S-211 is a small tandem two-seat shoulder-wing monoplane with a retractable tricycle landing gear and powered by a single Pratt & Whitney Canada JT15D -4C turbofan. Also, the aircraft was designed for a secondary close air support capability with four underwing hardpoints for the carriage of weapons and other external stores.The S211A was a slightly modified and updated variant of the S-211. The S-211A was a losing contender in the USA's Joint Primary Aircraft Training System (JPATS) aircraft selection. Among the seven to enter, the Raytheon/Pilatus entry won, which became the T-6 Texan II. The S-211 team was initially partnered with Grumman, and then Northrop Grumman after 1994. Since the 1990s, the Philippine Air Force has been using the S-211 as a Trainer with secondary Attack Capability. These were redesignated as AS-211s and nicknamed as "Warriors". With the retirement of the F-5 fighters in 2005, the additional task of air defense was assigned to it as well. Because of this, the Philippine Air Force initiated some improvements to the AS-211s to improve its combat capability through a series of programs and innovations. The first program was called "Project Falcon" which installed the Norsight Optical Sight from retired F-5s into the AS-211. The program was initiated by Lieutenant Colonel Enrique Dela Cruz, the Group Commander of the 5th Tactical Fighter Group. This was followed by the "Project Falcon Uniform" program which repainted the aircraft with a 2-tone Light and Dark Ghost Gray paint scheme along with low visibility markings to reduce their overall visibility. The "Project Falcon Hear" program saw the optimizing of air-ground communications on the AS-211 by upgrading and installing the AN/ARC-34 UHF radios from the F-5A/B.These aircraft were also fitted with a Belly Gun Pod designed, developed and manufactured by Philippine company Aerotech Industries Philippines, Inc. (AIPI). Each Pod is equipped with an M3 .50 cal Machine Gun, an automatic charger and approximately 240 rounds of .50 cal ammunition. Original production version with total of approximately sixty built and was operated by the Air Forces of Haiti, Philippines and Singapore. Proposed version developed with input from Grumman for the JPATS (two prototypes, converted from two former Haitian S-211 aircraft). Served as Trainers with secondary combat capability with the Philippine Air Force and were nicknamed as "Warriors". Starting in 2005, these aircraft were upgraded by fitting the Norsight Optical Sight and AN/ARC-34 UHF Radios from retired F-5s. It is also equipped with a .50 caliber belly Gun Pod made by Aerotech. Modernized and uprated version announced by Aermacchi in 2004 (two prototypes built). 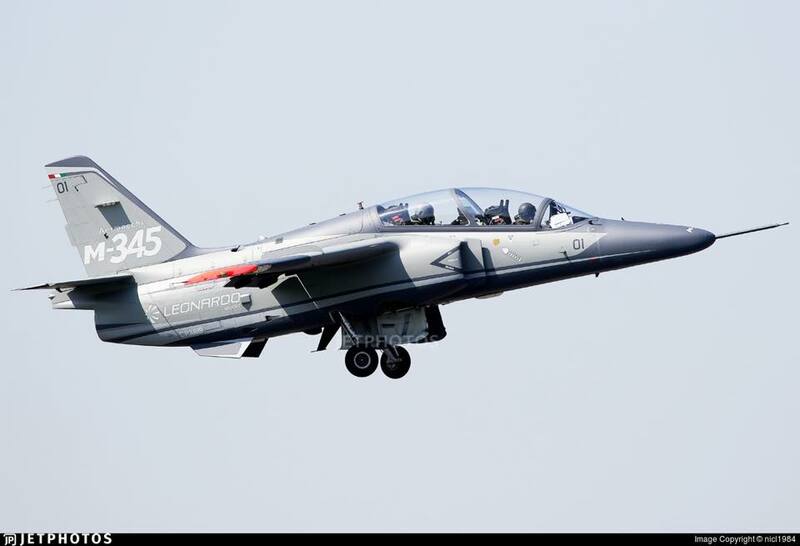 The Aermacchi M-345 High Efficiency Trainer (HET) is the latest military pilot trainer aircraft developed by Leonardo's Aircraft Division. Aimed at the basic-advanced phases of the training syllabus, will offer low acquisition and operating costs. As a replacement for the current Italian Air Force MB.339A fleet, it will also re-equip its famous “Frecce Tricolori” aerobatic team. The M-345 HET philosophy aims to offer the superior performance and training effectiveness typical of jet aircraft at costs comparable to high-powered turboprop trainers. Thanks to its modern avionics, considerable external load-carrying capability and performance, the M-345 HET is also suited for operational roles. Life cycle cost reduction is driven by long fatigue life and two-level maintenance, the latter made possible by replacing the expensive general overhauls with the airframe and systems Health and Usage Monitoring System (HUMS). Avionics are based on the latest M-346 Advanced Jet Trainer experience and match the standards of the latest combat jets, including HOTAS controls, Head-Up Displays (HUD), Multi-Function Displays (MFD), the real-time datalink and the Embedded Simulation system aboard the aircraft. The M-345 HET is powered by a turbofan in the 1,600 kg / 3,500 lbs. maximum thrust range. The airframe is stressed for +7/-3,5 g. Operating efficiency is ensured by single-point pressure refueling and on-board oxygen generation (OBOGS), both of which reduce ground support crews and turnaround times.